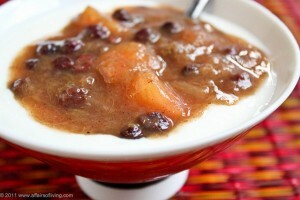 Sweet and aromatic, this compote is excellent served warm or chilled. For a simple fruit dessert, it can be served alone, or spooned over yogurt or ice cream. It is also very good served over pancakes or waffles. For a savory twist, serve alongside grilled or roasted pork or chicken. The flavors of this dish are perfect for autumn, so freeze some of your rhubarb to use later on this year when the seasons change! Prepare rhubarb and apples as directed. 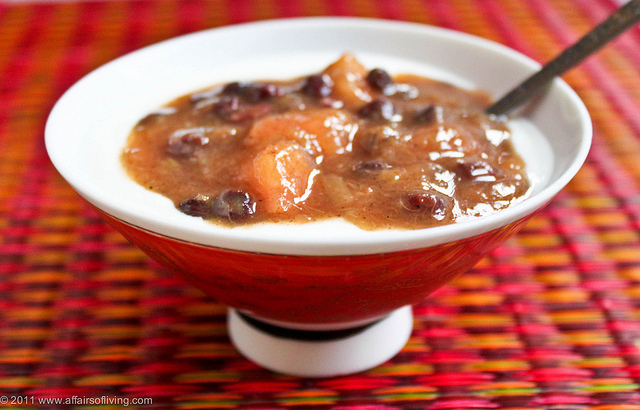 Place in a saucepan with raisins/currants, apple juice, and spices. Bring to a high simmer over medium-high heat, then turn off heat, cover, and let sit for 5 minutes. Remove cover and stir in honey, lemon juice, and vanilla extract. Replace cover and let sit for 3-5 more minutes. Let cool slightly before serving, mixture will thicken as it cools. This is also excellent served chilled.